Who doesn’t love a juicy, cheesy jalapeño popper? I used to get them all the time when I worked at Sonic back in the day. Couple that with some ranch and holy moly. I wish I had the metabolism to handle that nowadays. 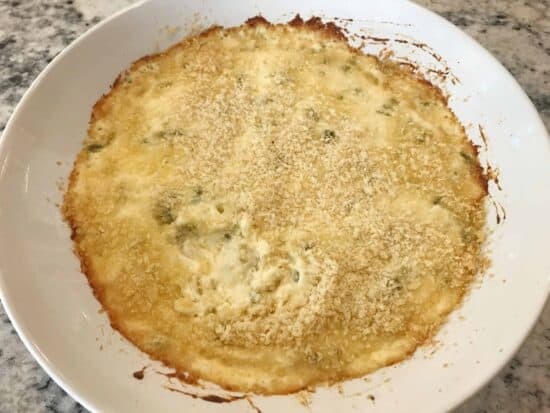 This Jalapeño Popper Dip gives you all the flavor of the original thing, but in the form of a creamy, cheesy, slightly spicy condiment for your tortilla chip. Again, I’d love that metabolism back. I’ve seen TONS of variations of this recipe. Some use only ‘real’ jalapeños. Some use only canned jalapeños. Some use a combo. I use only the jarred goodies that are already diced. That way, I can refrigerate the rest for some other yummy concoction down the line. I like a good, shallow oven-proof dish that allows for scooping without too much gettin’ on your chip. I like a good chip-to-dip ratio, you know what I mean? This Le Creuset lovely was on sale during the Nordstrom Anniversary sale for only $30. A steal if you know anything about Le Creuset! This recipe can’t get any easier. Let your cream cheese come to room temperature (no, you won’t get sick). Put the cream cheese + mayo + shredded cheddar + grated Parmesan + diced jalapeños in a biggo bowl or mixer. Whip everything together in a standing mixer fitted with a spatula paddle OR just whip it up with a hand mixer OR just get your elbow grease going and use a whisk. Spread it all out in an even layer in your greased oven-proof dish. Sprinkle on a combo of panko breadcrumbs + grated Parmesan. Voila! I give you the ultimate party dip for your chip. Mix the cream cheese, mayo, cheddar cheese, 1/2 cup Parmesan, and jalapeños in a bowl or in an electric mixer fitted with a spatula paddle. Pour into a baking dish sprayed with cooking spray. Mix the Panko breadcrumbs and 1/4 cup Parmesan in a small bowl. Evenly sprinkle over the top of the dip. Bake at 350 until the cheese is bubbling and the top is golden brown (about 20 minutes). Garnish with sliced jalapeños (optional). Serve warm or at room temperature with tortilla chips.